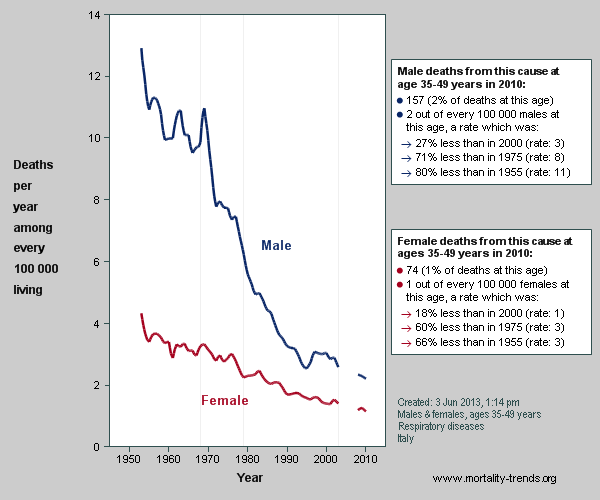 Legend: Any faint vertical lines which may be visible in the main plotting area indicate years in which the country changed its coding of causes of death to a new version of the International Classification of Diseases. Note about graphs for Italy: The gap in each graph is caused by an absence of Italian mortality data for 2004-2007. Method: Mortality rates were calculated using data from the World Health Organization and the United Nations Population Division, then standardised for age (by taking unweighted averages of component rates) and smoothed (as weighted 3-year moving averages). For details, see the Info page. Caution: Trends can reflect not only changes in disease occurrence or treatment, but also changes in how a cause of death is defined or coded. (The same factors can also account for differences in mortality rates between different countries.) Those due to changes in definition or coding are artefacts, and may be indicated here by dotted (or thin) lines. But, many artefactual trends have no such indication.